Well, it was party time at the OK Corral (aka Forest City Velodrome). While the spectators (and officials) gorged themselves with the free cake celebrating the velodrome's second anniversary, the riders put on numerous races both exciting and fun. 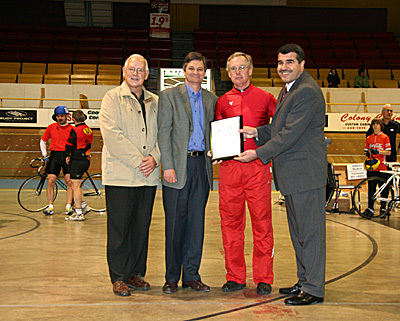 Early in the program, special guests MPP Chris Bentley and MPP Khalil Ramal, along with John Lessif and Sheila Simpson of the Trillium Foundation, presented Rob Good of Forest City with our 2007 Trillium Grant. The generosity of the Foundation is very much appreciated and gives us the opportunity to successfully expand and grow our programs. On the track Junior rider Stephen Meyer set a new 3000 metre track record with a blistering 3:44.90. Jamie Shankland was on his way to a new flying lap track record when his tire tape separated from the tire and he crashed heavily into the boards. The result fortunately was nothing broken but a very bad hip bruise. Keithie (Keith) Thorarinson and Lornie (Lorne) Falkenstein had a sprint challenge on mini-bikes. Thorarinson turned around and went the wrong way around the track to try and beat Lornie to the line. Lornie seeing what Keith was up to cut through the infield. It was a great laugh for all. Youngsters Andy Christie (aged 88), Magnus Graham (aged 77) and Ernie Regan (aged 75) put on a 20 lap race with Graham outsprinting Regan and Christie to take the win. The three former air force members with a combined age of 240 years showed that their fitness is remarkable. Six teams competed in the madison with Byer and Bester pulling out the win by capturing the last sprint for double points. The velo-kids rode numerous events during the program and had everyone cheering them on. 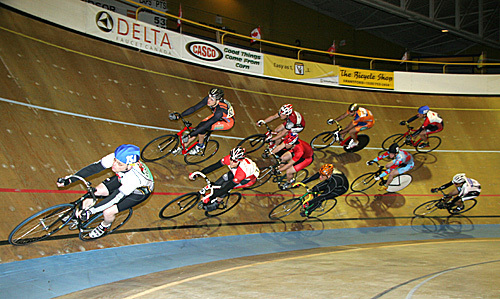 Next race event will be the Ontario Provincial Track Championships June 1, 2 & 3. Check website for details - www.forestcityvelodrome.ca.